For second-language writers, academic writing in English can be very challenging. Non-native English students can apply structural, linguistic and stylistic skills and strategies, to help them produce English academic texts. This book aims to increase learners` awareness and understanding of these skills and strategies, resulting in a more mature text and a more mature writer. 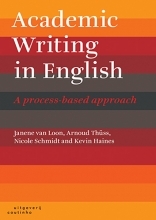 Academic Writing in Englishtakes a process-based approach. Students are guided through the academic writing process, using their own material as the focus of this writing practice. During this process, learners are encouraged to practice new techniques at various levels of difficulty and to reflect not only on their own written work but also on the work of their peers. Students are exposed to high-quality models of academic writing, from explanatory and argumentative essays to research reports and investigative business reports. The texts are accompanied by a large number of exercises which enable them to develop their proficiency in written English from B2 to C1 level. In this third edition, example texts are updated, new theory is added and there is more practice material, like exercises. In addition, the book contains more information about resources supporting academic vocabulary, such as Google Ngram Viewer, more information about documenting sources and a more elaborate section on flow and designing for the reader. The book is intended for Dutch and other non-native English university students who are studying for a bachelor`s or master`s degree. The authors work at the Language Centre of the University of Groningen and at the University of Arizona. They teach a wide variety of English courses for university students, staff and external clients. Three of the authors are native English speakers.